I used to get "upset" (though that is too strong a term) when I got downvoted without comment. If my answer isn't good enough then I'd like to know why. Not only does it improve the answer for the OP but it improves my knowledge too. Where the down-vote has been explained I've found it useful & it has improved my answer, or forced me to delete the answer if it was totally wrong. So is there any way we can encourage people to leave a comment? Perhaps they don't lose rep if they explain their down-vote? I must admit though that I haven't always explained my down-vote either so you could call me a hypocrite. I've also grown a thicker skin over the months of using SO (it seems to have come with the higher rep score ;-)), so I'm less bothered about this now. The comments are there for people who want to explain their downvotes. Please consider adding a comment if you think this post can be improved. After the first downvote, we can't say we didn't remind them, and honestly that's as good as it gets. Forcing a comment will end in even worse results. edit: this is now status-completed and live for users with reputation below 2000. It is shown on every downvote until you get to 2k. The more I use it, the more I think that Slashdot has the best discussion and moderation system out there. This is inspired by it, but in a Stack Overflowish way. Waited for a question to come in. Had an, imho, elegant answer. Got an upvote. Great. A couple of hours pass. A downvote. Huh? I start doubting myself. I doublecheck my answer. It's still elegant. I elaborate on it and give a code example. Nothing changes. After a primary frustrating experience of not being able to comment on someone else's response to a question, a secondary frustrating experience of being downvoted without any good reason. Jeez. Tough place to give answers. First impression is this place is packed with egos and downvoting teenies. Kyle suggested I post on here as Shog9 and I were having a discussion in the comments of this closed question. This is a somewhat non-answer, but I think it's worth posting anyway. For more on my voting patterns, see my blog entry. Shog9 makes the entirely valid point that he doesn't owe anyone an explanation for a downvote. While I take that point, I generally try to argue in terms of "what does the world most good?" If an answer is actually wrong or misleading in some way. I'd say it deserves a downvote. If no-one has stated why it's wrong/misleading (at least in terms of what you see as the problem with it) I think it's definitely helpful to leave a comment alongside the downvote. If someone else has already left an appropriate comment, then upvoting the comment is indication enough, IMO: the poster certainly has something to work on. The trouble is, there's a tension here. I have absolutely no right to tell Shog9 how he should or shouldn't vote... but if everyone votes in roughly the same way, then the votes carry more information. Suppose someone decides that they like the direction "down" more than the direction "up" - so they decide to vote down all the posts they like. I think we can all agree that's not a helpful behaviour, but it's a personal choice. That's a very extreme example of course, rather than the distinctly grey area of real life, but I hope it's useful nonetheless. Should we ask for guidance from on high as to how Jeff thinks we should be voting? Is this just a storm in a teacup? I know RichB believes so (or at least his comments on UserVoice have led me to think that) but for me it's about trying to improve the quality of my answers - and when I give a downvote, it's to improve the quality of someone else's answer, or to at least stop other people from believing something which is untrue. A good way to combat the chase perpetrator to downvote would be to have a period of anonymity so that the user who answered or downvoted/commented would not be known until the dust has settled (seven days). This may also go some way to solve the voting for friends/famous people issue that is rife on Stack Overflow. I think comments for downvotes should be anonymous for ever (as Jonathan Sampson and redsquare). Then the downvoter does not have to live in fear of retaliation. And the downvoted will get the information to improve her/his answer. IMHO, it's neither desirable nor truly possible to enforce consistency in voting. Some people will upvote answers they like, answers they think are underrated (sympathy votes, etc), or merely answers by an author they feel deserves a reward for actions elsewhere. And downvote for a similarly wide variety of reasons. If comments are encouraged or enforced, we'll almost certainly see some change in behavior, but I'm not convinced it will be entirely... or even largely positive. My primary rationale for this line of thinking is that some votes on SO are already not anonymous, and already require a reason to be given: close votes require both. I think this discrepancy can be justified by the much larger potential impact of voting to close a question vs. merely down-voting it, and the corresponding desire for such votes to be relatively rare. None the less, you don't have to look far to find... spirited discussion following the application of such votes. Indeed, I'd be surprised if the outcry over perceived-unjustified downvotes even comes close to matching that over perceived-unjustified close votes. My personal feeling is that votes - up or down - have their primary value as hints to other readers: which questions are worth reading, which answers should I read first, next, at all. And I vote accordingly, doing what the site lets me to adjust the scores of answers to a given question to where they match my own personal opinion of what matters. I won't vote a decent answer to where it scores < 0, but I see no reason to leave it > 1 if a better answer scores lower, because if I were searching out an answer to the question, I'd want to read the most comprehensive answers first. I don't have a hard and fast rule on this though; sometimes I'll vote on every answer to a question, other times I'll only vote for one or two. Going forward, I think it's more valuable to adjust the site to accommodate different voting patterns than to try adjusting each user's individual voting strategy. The latter is simply doomed to failure: no matter how much work we do to come up with workable guidelines, and how much evangelizing we might do trying to get users to use them, there'll always be new users who haven't bothered reading every FAQ and who'll still vote, or old users who just don't care. One possible solution to the problem of confused users with hurt pride might be that found on Slashdot: anonymous, pre-defined "reasons" for the down-vote. A user seeing their answer voted "Inaccurate", "Dangerous", or "Misleading" should take a good hard look at their answer, while another seeing his answer voted "Overrated" might simply shrug it off. The more I think about it, the more I think that downvotes per se aren't the problem. Incorrect downvotes are. Take this answer, Tim, who was actually kind enough to leave a comment, is actually wrong. The answer works. However well-intentioned, he's just wrong. Those kinds of downvotes annoy me. That answer currently has about 10 hours to receive a downvote before I'm better off just deleting it, which is kinda irritating. The other problem is that people use downvotes just for opinions they don't like, even if they answer the question. I've been downvoted a ton by Python fanboys because I dared to suggest using VB.NET as a RAD tool (instead of Python). Those kinds of downvotes are idiotic. The real problem that you would solve by disallowing anonymous downvoting is tactical downvoting where people just downvote something to give their own answer better relative position. I tend to leave a comment, but I don't* tend to downvote unless an answer is actively unhelpful (if you see what I mean). This is a good idea, but you'd have to be careful with it. When I see people explain down votes in the comments they aren't always tactful. Maybe if you were prompted with a small menu of acceptable reasons to be down voting and then if you chose "other" you could type something more specific. @downvoter: Care to explain your vote? I think it would be nice if this worked. As I understand it, the information on who voted is stored, so perhaps the down voter could be notified and allowed to reply with the identity "downvoter", if he or she so desired. I would suggest to force commenting ONLY when down-voting from 0 to -1. I think no answer deserves a negative quotation unless it's blatantly wrong or offensive, and then it also deserves at least an explanation! Maybe best using a list of "pre-made reasons to down-vote" like suggested by @Oorang. This would also encourage "up-voting all the other answers and leaving this one you think deserves the down-vote alone", which I think is better (IMHO). I suggest that you should be forced to leave a down vote answer and have an "up" arrow for the reason of the down vote. People can click it up and you will recieve +1 rep points for it. With a maximum of some number, let's say 5. You still lose your -1 when you press the down vote, but it would be gained back shortly if it is for a valid reason. There is unfortunately incentive currently though to NOT leave a comment. The person you are downvoting may be pissed off and down vote some of your answers. 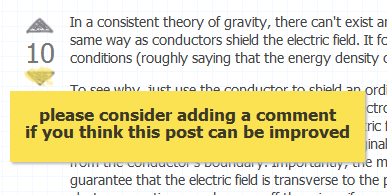 I think the current message "You've voted this post down - please consider adding a comment if you think this post can be improved" is enough. It will help improve the answer, or get the answerer to delete it. Which is better for all those people who have to read the answer. It will identify whether or not the problem is with the downvoter (misinformed) or answer (not useful). Keyboard chasing can be countered by those keyboard bashed comments "sdaasd" being downvoted or flagged, quickly stopping people from doing that. It will provide confidence and security in the downvoter. Without posting a comment for fear of retaliation it is like throwing a rock at someone then running away. If you beleive the person is wrong, then you should have enough "guts" and believe in your own opinion enough to express it and inform people on why your belief is better. Running away in my opinion serves no benefit. When people comment on downvotes, I always use it as an opportunity to learn up on the subject as my knowledge was obviously lacking in some way. I'll never retaliate by downvoting them, even if their comment was something along the lines of "That's wrong jackass". If you have a problem with people retaliating against you, either there is something wrong in the way you are interacting with people or you are interacting with the wrong people. After downvotes with no comments, my next biggest issue with voting is sympathy voting. Voting should be done on the worth of the question/answer alone. Not to correct some perceived injustice. As per other questions, there's an additional complexity here. A posts a response with a mistake. Now B can't remove the downvote. It seems to me that this site has become more about downvoters than the knowledge itself. Let's protect the downvoter from "revenge downvoting"
How does the downvote help with knowledge? A user seeking for answer "knows" that a question that has fewer votes than the another one is incorrect, or not so good. But the user doesn't know if someone downvoted the question (let's says it has 0 votes), or it was never voted. User also doesn't know why it is not good, if it was downvoted. It can give impression that this answer is maybe correct. Downvote didn't add any value to knowledge. An answer was downvoted and has -2 votes. A user seeking for answer "knows" that this is not a correct answer, but user doesn't know why. Clearly other "knownledgeable users" know that this is not the correct answer, but they didn't care to explain why and share their knowledge. Downvote didn't add any value to knowledge. A question has been downvoted. A user that asked question would like to improve its question, but doesn't understand where the problem is. Clearly the user will probably make the same mistake in the future when asking a new question and will be a possible candidate to new downvotes. Punishing a student just because student doesn't understand something is not a good learning practice. A downvote didn't add any value to knowledge. A question has been downvoted just because an answerer didn't like the opinion of questioner about its answer, and decides to downvote the question. The downvote didn't add any value to knowledge. What is the purpose of a downvote? If it is to clearly distinguish the correct answer from the incorrect ones, then just vote for the correct answer. If its purpose is to mark the answer as incorrect, then anyone not knowledgeable in topic will not know why is it incorrect, and needs to blindly accept the fact that someone thinks it's incorrect. Stack Overflow should not be about the voters, but about the knowledge. The more information we have, more knowledge we gain. Let's protect downvoter from "revenge downvoting"
There are mechanism that can prevent this, the fact itself that downvote must be followed with explanation is a solid mechanism. The downvoter should not even need to come to meaningless argument. An explanation for the downvote has been posted - this means other users can downvote/upvote it. It is not a rear case that arguments that follow some topic/article contained more knowledge than the topic itself. Mechanisms can exist to prevent user from downvoting in some time frame, that has lots of negative feedback on their downvotes. Any information that is constructive is good. If you think that a question/answer is not a perfect candidate for downvoting, then don't downvote it. Remember, it's not about power to downvote, it's about knowledge. I am sorry, but I have to say again: It is so frustrating getting a downvote without any explanation. You can not learn from it, you can not fix the problem, so what is the point? Whenever possible, try to leave frequent comments on posts where you’ve taken (or considered taking) a moderator action, explaining the reasoning. This is important so that community members can learn the norms of the community and the moderation policies. I like SOF because it is not made for lazy people. You have to work to benefit this platform. You have to write good answers to get your reputation points. You have to edit other users' answers to make this place better, etc. So why are people getting lazy when it comes to downvoting? If you don't have the time to explain set a pending downvote, this vote will be visible, but it will not have any effect on the reputation of the asker. If any other user will downvote with an explanation then the other pending downvotes will take effect. After one explanation had been set, users will be able to downvote with out any explanation. (Though it will be nice if they could upvote the note that the explains the downvote). Yes, I know this issue was discussed a thousand times if not more. I just don't understand what is the point of downvote with no explanation, at least one explanation for the first downvote. If you don't have the time or the patience to explain your downvote, don't do that. It is that simple. As a minimum, I'd like to see an option to delete my own answers when they've been downvoted. This has only happened once, but I'm puzzled as to why, but would like to self-censor and delete an answer no one likes. I'd like to see another option for downvoting - downvote based on another comment. e.g. This means if a comment explains a downvote, someone else can 'agree and downvote'; this provides more insight into the problem for the poster, without requiring duplicate comments. I'd also like a 'right to reply' on downvotes - maybe a feature to allow posters to communicate with downvoters via a mod - if the reason isn't clear, but a downvoter cares enough to downvote, they should also care enough to explain themselves. I agree with the option to allow Anon voting, however what about modifying the penalty for downvoting? Allow anonymous downvoting, but at a -3 or -4 reputation, but downvoting with an attached comment keeps the current -2 downvote, for instance. This does not prevent "asdf" or similar nonsense comments, but leaving those kinds of useless comments allows them to be flagged as unhelpful. This in itself could lead to a retaliatory behaviour, but I think that the flagging would bring appropriate (negative) attention to those individuals. Encouragement comments without discouraging down-votes from 0 to -1 can be provided via increased rep lost in this context (-3 for no comment), and deceasing the rep lost (usually -2) for a downvote with comment. Commenting can be made easier by anonymously up-voting a pre-existing comment, or choosing one of several canned comments already available in the community review process. All options will require text input (or perhaps will require text if you don't want a double fine), down-votes will be collapsed under categorized e.g. inaccurate (5), incorrect (1), if you expand you can see first 10 text inputs. Identities of down voters will not be revealed. Comments will remain unaffected by change. Bonus implementation - vote downs with garbage text can be flagged to be cancelled (with no explanation). If a user posts a question that is poor quality or is in some other way a good candidate to be flagged in some manner, I think it would improve the overall long-term quality of the site to require that the person down voting or flagging include a comment so rather than figuratively slapping and walking away, you slap educate and walk way. The 'now you know.. so don't make the same mistake twice' idea. In some cases, a user new to the site, or I suppose just an ignorant person such as myself, may not be aware of why their question was down voted or flagged. To them, perhaps the question seems completely valid atleast in their eyes. By posting a comment as to why it is in fact not to par and thus being moderated they are educated and less likely to make the same mistake twice. Obviously they'd know this if they were to read the guidelines of the site, but if there is to be community moderation then there too should be community education. If nothing more it doesn't hurt and only helps to promote the guidelines. If writing a brief explanation as to why is too much of a bother for the moderator, needn't be more than a single sentence or a few words, then I'd question the moderators overall attentiveness and motivation in the first place.. In general, the ideal goal of moderation should be to improve the long-term quality of the site, not solely as a means of punish the poster. If you think that just slapping a down vote on someone for posting a question will get them to go away and quit degrading the quality of the site.. well I'd argue that it's more likely they'll just setup a new account and continue degrading the quality of the site in their blissful state of ignorance or disregard. There's little we can do for those who disregard but at least we can attempt to educate the ignorant. I have seen a lot of good answers voted down for no apparent reason (both mine and others). I suspect that many times vote downs are due to lack of background required to understand the answer, however, in most cases voters don't bother to explain why they are voting down, hence they do not give the answerer an opportunity to further explain. Vote down with accountability - requires voter to add an anonymous comment starting with "-1" and explaining why he/she is voting down. Can be performed be users with 125 reputation and costs 1 reputation point (same as vote downs are now). Classic vote down - increase required reputation (e.g. 1000 instead of 125) to vote down without accountability and increase cost to reputation (2 instead of 1) and perhaps even require voter to have answered a few questions with vote ups himself/herself (e.g. require Teacher badge). Also, perhaps block other answerers from down voting and down voters from submitting to other answers to questions without un-down-voting (this can be done automatically when answer is submitted). - Prevent people from trying to make their answer look better in this way. Edit: I know this is similar to a few other answers (it combines parts of them and adds a bit more). To encourage people to explain downvotes, I think it would be humorous and maybe even helpful to offer a new badge called "Information Hoarder". Whenever a user has tallied 3 downvotes with no explanation, the user earns the badge. I'd suggest requiring a downvote comment if and only if the answer is accepted or has hit some upvote threshold. If it's uncontroversially bad, downvote away. But if someone ostensibly has seen merit, the question or answer is more likely to be of enough quality to deserve a quick comment. "But what if people start leaving comments like this is bad?" I hear you. At least we get to learn more from the people who downvote and do take the site more seriously. Only mature people (those with high reputation) are allowed to down vote? Disabling down votes when a question is closed so as not to lose more reputation. Not the answer you're looking for? Browse other questions tagged feature-request status-completed voting down-votes comments . Should everyone have to defend a down-vote? When voting an answer down, is it polite to add a comment giving a reason? Is it ever appropriate to question a downvote? Should basic netiquette dictate that we post reasons for downvoting? What to do with unexplained downvotes? How do I alert admins about potential vengeful behavior? Can I tell who downvoted one of my answers?